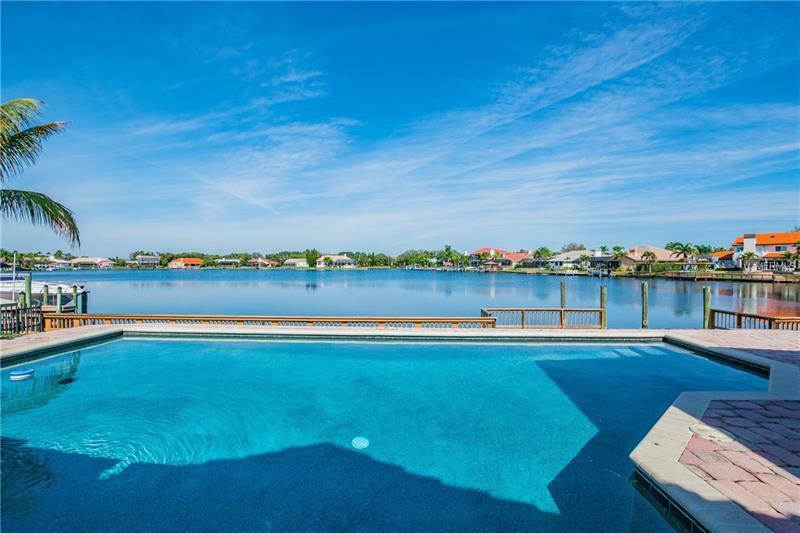 Spectacular WATERFRONT views from this lovely FRESHLY PAINTED home in the gated community of Bayside with BAY & GULF ACCESS! The moment you enter the foyer with it's TRAVERTINE flooring & beautiful entry doors, you will be amazed at the OPEN FLOOR PLAN with WATER VIEWS everywhere! HIGH CEILINGS, gorgeous STACKED STONE FIREPLACE, WET BAR & NEW FLOORING. The kitchen is huge, with a great BREAKFAST NOOK & is the perfect place to start your day! All STAINLESS STEEL APPLIANCES, a built in desk and COOKING ISLAND round out the kitchen area. You will love the spacious dining room with beautiful TRAVERTINE FLOORING. The master bedroom is enormous with FRENCH DOORS leading to a private sitting room/nursery/office with a window seat, 2 WALK IN CLOSETS & sliding doors out to pool area. The master bath has dual vanity with GRANITE COUNTERS, a separate shower & WHIRLPOOL TUB. SPLIT FLOOR PLAN, 3 guest bedrooms 2 with RENOVATED baths, & one serves as a pool bath with outside access as well, so no wet feet running through the house! The POOL/SPA area is your outdoor living room with BRICK PAVERS & is picturesque overlooking the water & your own dock. RECENT UPGRADES: NEW A/C, WATER HEATER / SOFTENER, ALL NEW LIGHTING FIXTURES, FANS, FLOORING, NEW A/C, INTERIOR & EXTERIOR PAINTED, NEWER APPLIANCES & DOCK RE-BUILT to name a few. This is the Fl lifestyle, lounging by the pool, fishing from your dock, having dock-tails with the neighbors! Great neighborhood fun, great location near airport, beaches, & great schools!